Text of a paper given by Niki Sioki at the conference of the Association of European Printing Museums, Making history: collections, collectors and the cultural role of printing museums, Museum of Typography, Chania, (Crete, Greece), 11-14 May 2017. The main aim of my presentation is to discuss printed ephemera related to Cyprus and to indicate their key role in the printing history of the country. Although my research is still in its beginning stages, allow me to share with you some first thoughts and concerns about tracing and collecting surviving items, their contribution to recording and mapping printing history, and finally let me suggest that forming a collection of ephemeral printed documents that are, for the time being, spread over various collections and archives would provide an important tool for printing and social historians as well as for educators in the graphic communication field. 1. 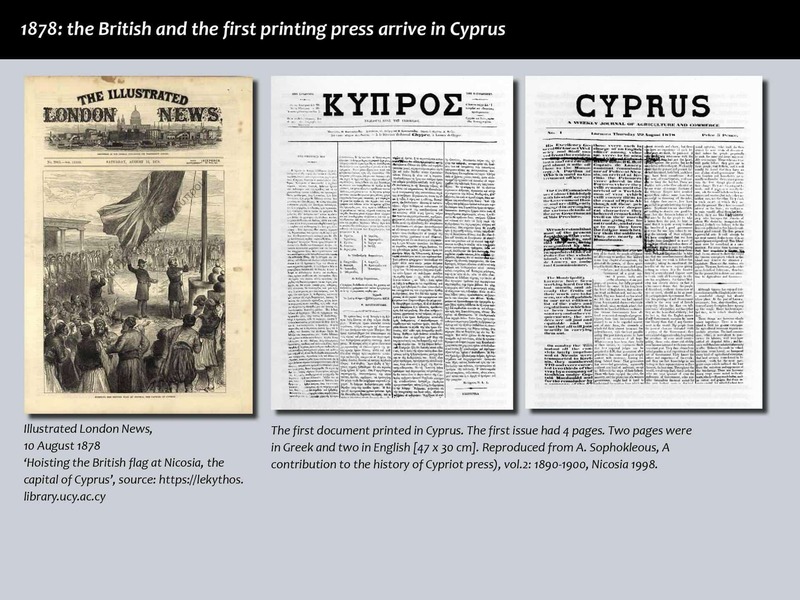 In what way is Cyprus related to the history of printing in Europe and printed ephemera? 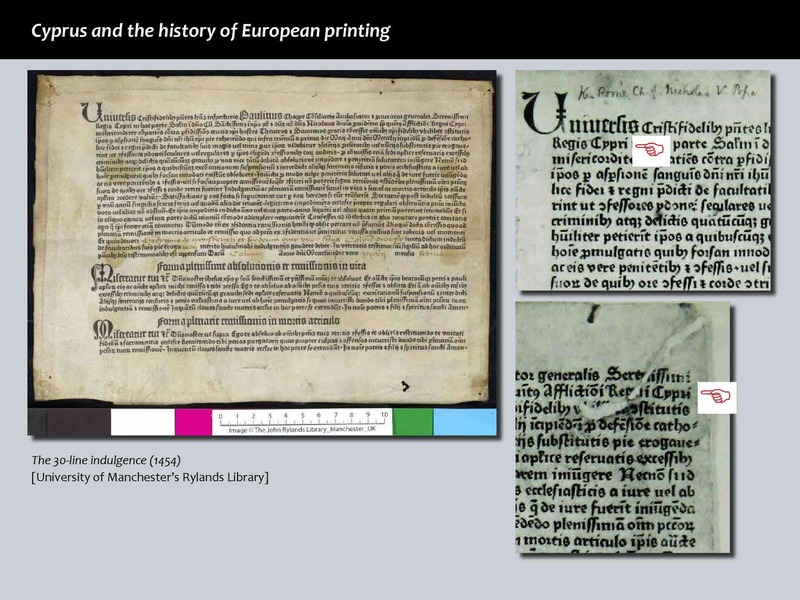 Printed ephemeral documents are closely connected to the history of the earliest printing in Europe. The name of Cyprus appears in what is considered to be the earliest surviving printed product in the West. That document was not a book, but a single sheet of paper printed on only one side, namely an indulgence. According to Peter Stallybrass an indulgence was the first dated printed product from Gutenberg’s workshop: Gutenberg ‘was already printing his great Bible when he stopped working on it to print 2000 copies of his thirty-line indulgence in 1454-55’. That indulgence had all the characteristics of a document that could be categorized as a printed ephemeron: it was printed without an identifiable author, for an institutional customer, the Roman Catholic Church and more specifically Pope Nicholas V, in order to fulfill a specific need, i.e. to collect money to aid in the defense of Cyprus against the Turks. The Cypriot noble Paulinus Zappe (or Chappe) was responsible for organizing the collection of money and the distribution of the Letters of Indulgence. 2. When was printing technology introduced in Cyprus? 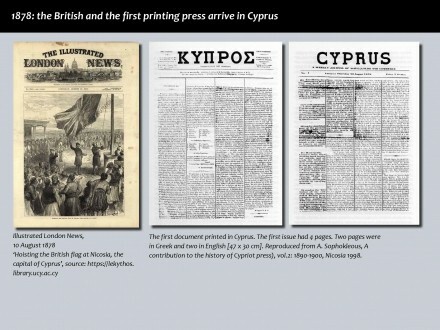 In Cyprus the introduction of printing technology coincided with the beginning of colonialism. In July 1878 the British arrived in Cyprus. Under the Cyprus Convention they assumed responsibility for the administration of the island from the Ottomans while the Sultan continued to keep the sovereignty over the island. The convention was cancelled in 1914 when the formal annexation of Cyprus by Britain took place. Finally it was in 1925 that Cyprus was officially declared a Crown Colony and the High Commissioner acquired the title of Governor. Until 1878 books and newspapers for the minority of the population who were literate were imported from abroad. If we adopt the notion that print culture is not simply defined by the presence of printed products in a society but it involves a wider social knowledge of these documents and the familiarity with buying, borrowing, lending, reading and handling these physical items, we could claim that a print culture was not present in Cyprus before 1878. In that year wealthy Cypriots in Egypt decided that the foundation of a Greek printing office and the publication of a Greek newspaper would benefit both ethically and intellectually those living on the island. Discussions with the Ottoman administration had been started even before the arrival of the British in Cyprus. However the first printing press arrived to Larnaca from Alexandria, Egypt, in the summer of 1878 after Theodoulos Constantinides, its first editor, had managed to get permission to publish a local newspaper from Sir Garnet Wolseley, the first British High Commissioner of Cyprus. Wolseley demanded that an English version of the newspaper should be simultaneously published. On the 29th of August 1878 the first issue of the bilingual newspaper KYPROS/CYPRUS was finally published inaugurating the beginning of production of print products on the island. The definition of the term ‘ephemera’ and which particular items it describes is an issue that has extensively preoccupied professionals and researchers coming from different academic disciplines both in the UK and the US. A working definition that is widely accepted and used is that which Maurice Rickards proposed: printed ephemera are ‘the minor transient documents of everyday life’. However for librarians and archivists, such as Timothy Young, who serve library collections and have to categorize and catalogue ephemeral material this is ‘a definition more poetic than it is practical’. Following this line of thought Young suggested that a practical definition could be based on two criteria: format and function (i.e. intent or life utility). Responding to these critical comments Michael Twyman acknowledged that Rickard’s definition might not be the ‘perfect definition’ but provides researchers with ‘a good starting point’. To this I would like to add that the term ‘transient’ may be considered as poetic but it definitely emphasizes the main characteristic of ephemera; ironically it is their connection to the transitory that make them so valuable today. Currently, most ephemera in Cyprus survive in museums such as the Leventis Municipal Museum of Nicosia, local collections focusing on specific themes, such as the Cyprus Railways Museum in Evrychou and the Centre of Visual Arts & Research in Nicosia, archives such as the State archive and the Bank of Cyprus archive, and private collections. The above collections reveal how valuable was and continuous to be the contribution of collectors in the survival of ephemera in Cyprus. Items that were produced in the past to have a limited useful life were acquired by collectors and had their life extended and their value and meaning changed in the present. In these museums and collections ephemera are mostly presented as ‘documentary artifacts’ which provide visual insights to aspects of social life and culture in the past with a focus on the period of British rule (1878-1960). In all cases they ‘serve as the material basis for the production of narratives about the past’. In the showcase of the museum and the collection, ephemera become objects transformed from ephemeral commodities to representatives of past culture. To my knowledge, there is no available study which uses ephemera produced in Cyprus as historical records related to local social and printing history. The book by Andreas Sofokleous on the history of advertising in Cyprus is a useful visual survey which provides evidence of the range of ephemera which are related to commercial activities. At the same time it also reveals the difficulties surrounding tracing, collecting and studying ephemera in Cyprus since most of them being located in private collections with limited access for researchers. Paraphrasing Julie Anne Lambert, I would like to claim that ‘the delight of ephemera is that they add pieces to the jigsaw puzzle that is printing history in Cyprus – pieces that cannot be found elsewhere, otherwise “missing links”’. Historians of British colonialism have already ascertained that ‘The locomotive was a symbol of design that reached the most remote corners of the British Empire […] it served as a reminder of Britain’s power as much as solving logistical issues’. Cyprus was not an exception to the above observation. 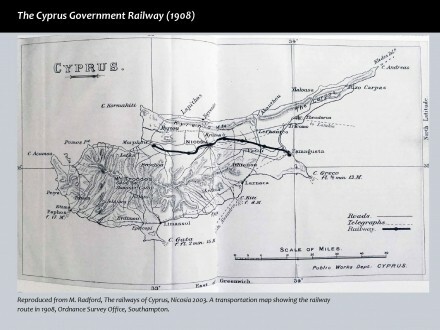 The idea of constructing a railway system in Cyprus was raised right from the beginning of the British occupation due to the absence of a road network. However constructions started much later in 1904 and until 1915: a railway system 76 miles long linked Famagusta to Morphou, namely the east coast with the west coast of the island. It was used for the transportation of people and goods and it also accommodated postal and telegraphic services. Having served both the local community and the colonial authorities for 47 years, the railway ceased to operate in 1951 due to financial reasons and the competition by the developing road transportation system. Printed ephemera related to the CGR are mainly part of the collection exhibited at the Railway Museum in Evrychou (a village located 50 km south-west of Nicosia). They are important relics of the period when a railway system operated in Cyprus. Their content provides evidence of how travelling by train was intertwined with aspects of everyday life and influenced the local culture. The organization of local fairs, festivals, and other activities such as the excursions of Nicosians to Famagusta for their summer baths were events related to the travelling opportunities created by the railway. The train was also used to transport distinguished officials such as Winston Churchill who visited Cyprus as the undersecretary of the Ministry of Colonies in 1907. At this point, it would be worthy to remind Robin Kinross’ claim that there is no pure and neutral information in communication. Likewise information provided by ephemera is not neutral. On the contrary, and as I will show, it is articulated and organised in a rhetorical way that served the colonial authorities. At the same time, when approached as printed documents, ephemera reveal the state of the available printing technology and typographic practice. The surviving ephemera include timetables, different types of tickets and passes, memoranda and forms for different purposes. Until now three timetables have been traced, two in portrait format and one in landscape, dated from 1938, 1940 and 1948. They were produced as posters meant to be publicly displayed at stations. They were printed on cheap paper since they were intended to survive for short periods of time and to be discarded after use. A study of the paper trade in Cyprus during the first decades of the 20th century could provide some interesting data, but it is still pending. It is not known how often or how regularly the timetables were updated and how many copies were usually printed. It seems that they were the main design documents through which information about travelling by rail was imparted to users. The small size of the train transportation system is reflected in the surviving timetables. 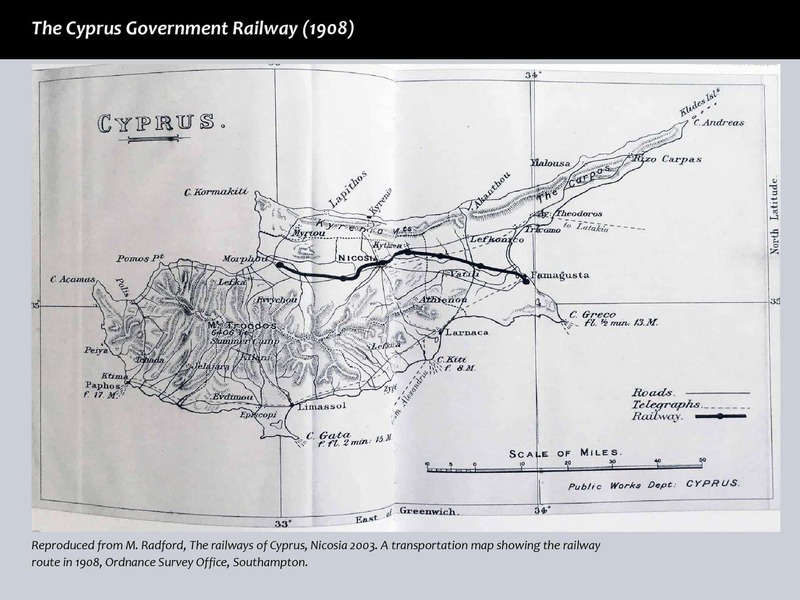 All of them refer to the first line that was constructed between Nicosia and Famagusta, linking the capital with a port city; a line which facilitated the transportation of products from the valleys and the mountainous areas on the island, covering 36 of a total of 76 miles. Later on the train service was extended over two additional routes. Timetables conveyed the departure point, the arrival point, the stations and the time of departure from each station. The simplicity of the system was also apparent in the design of the timetables. Both location and time were organised in vertical columns. Time was split between morning and afternoon in two different columns indicated by the headings ‘forenoon’ and ‘afternoon’. No extra clarification was provided either by the twelve-hour clock system or the abbreviations ‘a.m.’ and ‘p.m’. Numbers indicating hours and minutes were separated with a decimal point. Bold capital letters set in sans serif type indicated the most important information, namely the route direction and the departure and arrival points. Names of stations were set in serif type, main stations were set in all capitals and smaller stations in upper and lower case. In addition to text, rules, dot leaders, and space were the basic typographic means for the articulation and organization of the information. All three tables were produced in black and white. Based on what we know so far, the absence of colour could be attributed to financial reasons; any assumption related to technical reasons, for e.g. the unavailability of the appropriate presses, would require further research and a larger sample. The complexity in the timetables of the CGR stemmed frpm the need to address multi-lingualism. In some cases a timetable had to accommodate three languages which represented the official colonial administration (1878-1960) and the Greek and Turkish communities which had the right to use their own language in private and in public and to receive instruction in it. The 1938 and 1940 timetables were published solely in English. In the 1948 timetable, the word ‘timetable’ at the top and additional guidelines at the bottom of the table were set in English, Greek and Turkish. The need to accommodate all text in three languages imposed the arrangement of information in three columns at the bottom of the table and was most likely the main reason for choosing a landscape format. The production of the documents was probably the work of the Government printing office which since its foundation provided for the printing of administrative documents in three languages. Tickets which included too much information that had to be accommodated within a very limited space, were always set in the language of the official administration. The tickets were of the Edmonston-type that was introduced in British Rail in the late 1830s and early 1840s. Colored cards were used to identify the different classes of travelling and other varieties of tickets, e.g. tickets for children and return tickets. A sample of a third class paper ticket was printed only in Greek and Turkish on one side with conditions on the reverse also available in English. The choice of languages could indicate that the majority of the users were members of the two communities while it was highly inappropriate for members of the ruling class to travel in third class. Finally the promotional notices for the local fairs printed in 1914 which are kept at the State archive are worth discussing: they were set in three languages and three alphabets. Text was set in three rows which, due to the limited space, were separated by horizontal rules. A typographic style usually found in books and newspapers was applied where a number of headings were followed by a short amount of text. Conventions in texts differed as we can see if we compare the English and Greek texts where words in English are emphasized by being set in all capitals, but no emphasis was applied on the Greek text. These announcements are the only examples where a decorative element appears at the top of the document. The small engraving printed from the collection of stock blocks with which the printer was equipped is very much the same with similar little cuts that can be found in travel notices produced in Britain. To what extent British typographic and printing conventions influenced the local print production is a question that research in ephemera could address. An additional issue that is worth discussing is related to the arrangement of texts in tri-lingual documents. The English text was positioned at the top and was followed by the text set in Arabic and Greek. A similar arrangement can be seen on the proclamation of 1908, on the tariff of fares for public carriages of 1908, and on the cover of a Register of Births from 1928-1929 exhibited at the Leventis Municipal Museum. Based on the items that have been examined so far, this pattern of arrangement was changed after 1935 when the Latin alphabet started to be used for setting texts in Turkish. More research is needed to identify whether the decision about the sequence in which the three texts were presented was dictated by political or merely practical reasons. Railway ephemera brought Cypriot population into contact with graphic design. A question worth asking could be about the quality of design that Cypriots encountered when travelling by rail. The overall quality of design applied on railway ephemera was mainly utilitarian without any aesthetic aspirations. Letterpress was the main printing method applied, works were printed in black and white, and coloured papers in different qualities were used to indicate a different value. Typefaces, both serifs and sans serifs, were those available in the local market with no variety in the display types that could be probably used for notices and other promotional materials. Greek Didot (known as apla) was the most common typeface used for setting Greek texts and further research is needed to identify the variety of the Latin typefaces. Although printed ephemera produced in Cyprus have already attracted the interest of collectors and museums they were mainly used as cultural artefacts that reveal aspects of local social and business history. My main aim in this presentation was to show how printed ephemera produced in Cyprus could also contribute to the exploration of the local printing history. There are many questions that wait for answers indicating the need for further research. For example most of the items I discussed were produced by the Government Printing Office whose history has not yet been recorded. 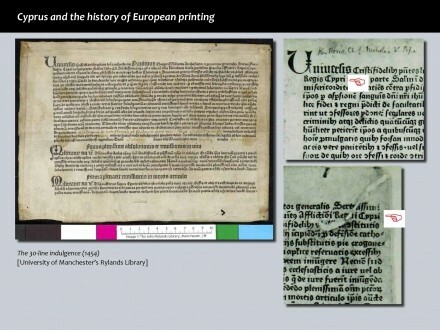 What I would like to suggest is a way to reframe and recollect printed ephemera as important relics of the development of the local printing trade and the evolution of printing practice from the introduction of printing in Cyprus until the introduction of digital means for the reproduction of text and images. To this aim surviving items should be brought together under the same roof. As researchers have already suggested printed ephemera acquire value when presented in large collections. According to Mary-Elise Haug ‘the most valuable ephemera collections are the largest ones’ where printed ephemera are assigned new meanings and cultural values and the collection can function in a double way: as a research tool to produce new scholarship and as an educational tool to teach printing history and graphic design. Similarly Martin Andrews suggested that individual ephemeral printed documents may look ‘trivial’ and ‘peripheral’ but organised in a collection they ‘can throw a very particular light’ on history. Therefore, we should aim at advocating for the construction of a collection of ephemera that would be as inclusive as possible bringing together most of the ephemera that are now scattered over different collections and locations. It should also focus on items produced both locally and abroad since a comparative study could lead to interesting conclusions. For example a number of the lithographic posters that were used to promote Cyprus as a tourist destination in the 1930s and 1950s were designed by Cypriot artists but were printed in Greece. Comparing them with locally produced posters could be revealing about the available technology or skills. An online digital collection could be a rather practical and time saving solution since it could benefit by existing projects as, for example, the digitization of the John Johnson collection of printed ephemera provided by the Bodleian libraries. Ideally such a collection should be connected to a printing museum. For the time being our main goal is to advocate for the value of printing heritage among the local community of researchers and professionals. P. Stallybrass, ‘”Little jobs” broadsides and the printing revolution’, in: S. A. Baron, E. N. Lindquist, E. F. Shevlin, Agent of change: print culture studies after Elizabeth L. Eisenstein, Amherst: University of Massachusetts Press, 2007, p.317, note 1. J. Ing, ‘The Mainz indulgences of 1454/5: a review of recent scholarship’, The British Library Journal, 9, 1983, p.17. J. McElligott, Jason & E. Patten, The perils of print culture: Book, print and publishing history in theory and practice, London 2014, p.5. A. Sofokleous, Συμβολή στην ιστορία του κυπριακού τύπου (A contribution to the history of Cypriot press), vol.2: 1890-1900, Nicosia 1998, pp.31-32. M. Rickards & Twyman M., Ephemera: a guide to the fragmentary documents of everyday life for the collector, curator, and historian, London 2000, p.v. T. Young, ‘Evidence: toward a library definition of ephemera’, RBM: A journal of rare books, manuscripts and cultural heritage, 9(1), 2008, p.12. M. Twyman, ‘The long-term significance of printed ephemera’, RBM: A journal of rare books, manuscripts and cultural heritage, 9(1), 2008, p.19. J. Mussell, ‘The passing of print’, Media history, 18(1), 2012, p.83. Mussell, The passing of print, p.81. J. A. Lambert, ‘Immortilizing the Mayfly: permanent ephemera: an illusion or a (virtual) reality?’, RBM: A journal of rare books, manuscripts and cultural heritage, 9(1), 2008, p.144. A. Tindley & A. Wodhouse, Design, technology and communication in the British Empire, 1830-1914, London, 2016, p.1. A.-M. Hadjylira, The Cyprus Government Railway (1905-1951), Nicosia, 2006, p.2. R. Kinross, ‘The rhetoric of neutrality’, Design issues, 2(2), 1985, pp.18-30. Sophokleous, Cypriot press, vol.2, p.282. J. Lewis, Printed ephemera, London 1969, p.94. M.-E. Haug, ‘The life cycle of printed ephemera: a case study of the Maxime Waldron and Thelma Mendsen Collections’, Winterthur portfolio, 30(1), 1995, p. 68. M. Andrews, ‘The importance of ephemera’, in: S. Eliot & J. Rose (eds), A companion to the history of the book, West Sussex, 2009, p. 434.